I went for a walk down at Mullens very early the other morning with a couple of friends. The tide was well out and the sand flats were exposed. As we walked we were facing into the sun and Sarah took this silhouette photo of my dog Misty. 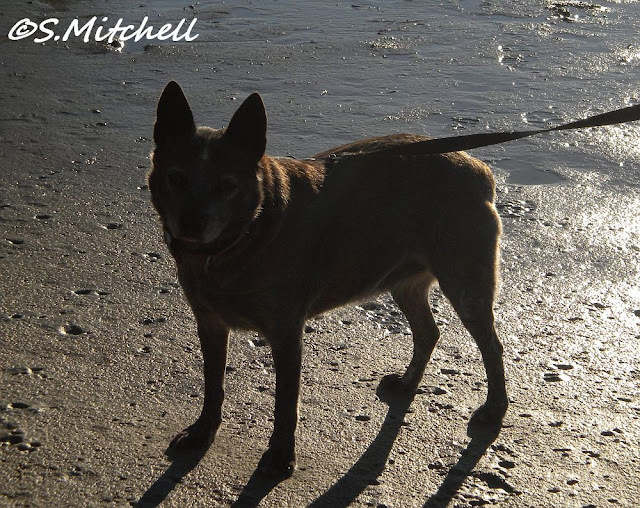 Misty is a Stumpy-tailed Blue Cattle dog and one of the smartest dogs I have ever had. She usually walks off leash and watches for birds for me to photograph. Then she comes back and stands behind me and nudges my leg until I get the camera up and take the photos. There was quite a heavy dew on the grass and this looked so beautiful with the light glinting off the dew drops that I took a number of photos hoping to capture some of the magic of the light. One photo turned out OK! There were very few shorebirds to see. It is after all winter here, and most shorebirds have migrated to the northern hemisphere where they breed. I could hear Brown Honeyeaters - but they come around my house and I can take my time photographing them there. 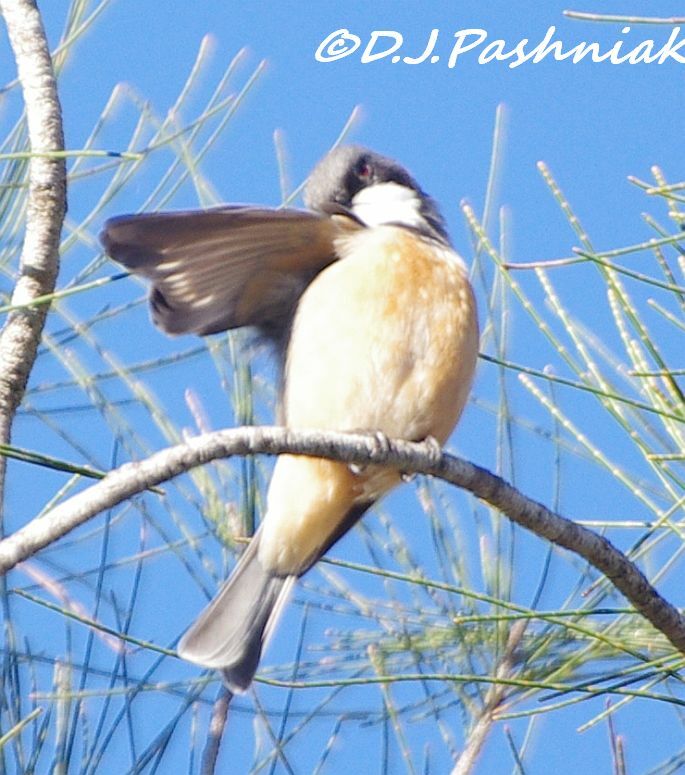 I had stopped to try for a Fantail - but they are a study in constant movement and it eluded me. 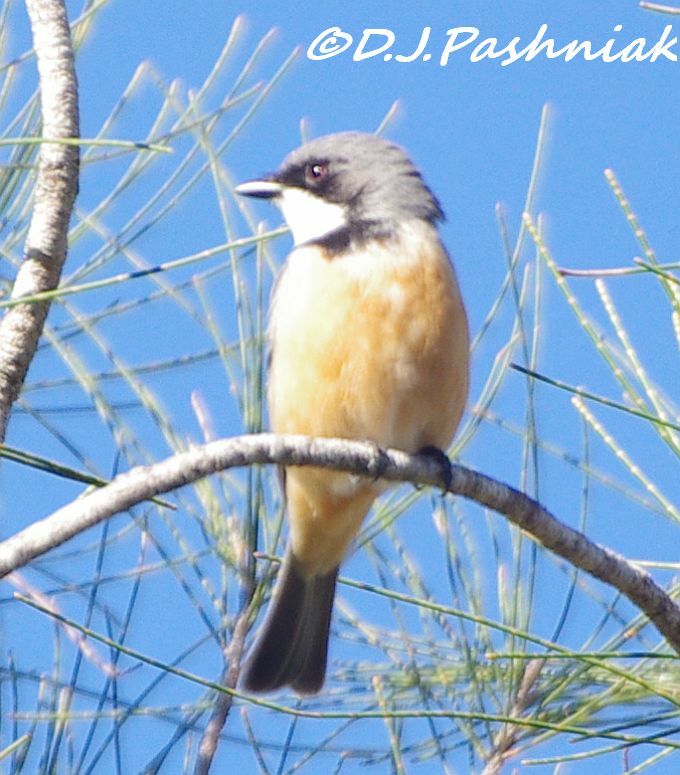 Sarah called my attention to this Rufous Whistler which was sitting high in a tree. It was almost out of range of my 300mm lens but I managed some photos although they were not as sharp as I would have liked. It apparently felt quite secure up there and decided to have a good preen before it flew off again. Once I had stopped I realized that there were a number of other birds in the shade of the trees. This one had its back to me but that green color on its back is unmistakeable as a Cuckoo. 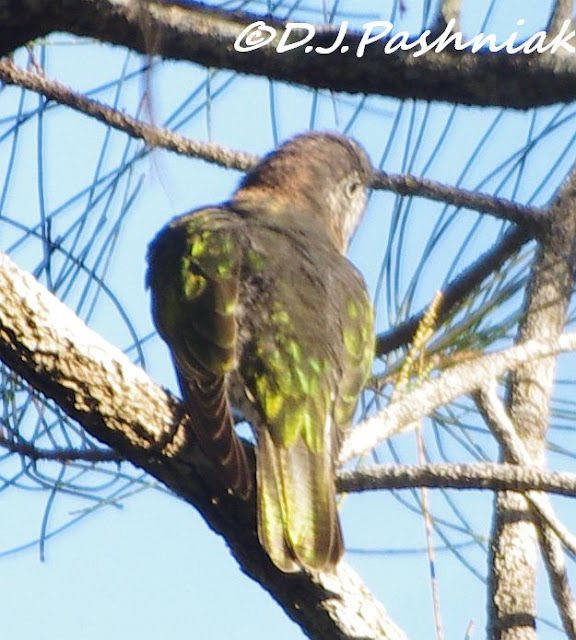 It has been ID'd for me as a Shining Bronze Cuckoo. For more birds from around the world visit Wild Bird Wednesday. Ah,so you have a lot of help when you're hiking. Boom & Gary of the Vermilon River, Canada. love your sweet and intelligent pup. :) and that 2nd shot is awesome! Honey eaters seems to be great birds. Misty is one smart dog, I wish my dog could help me spot the birds. The Rufous Whistler is pretty. Congrats on the Cuckoo. Great shots! Beautiful birds, Mick! I love the sun sparkling off that water drop! Misty is very well behaved! My dog barks at all the birds and scares them away! 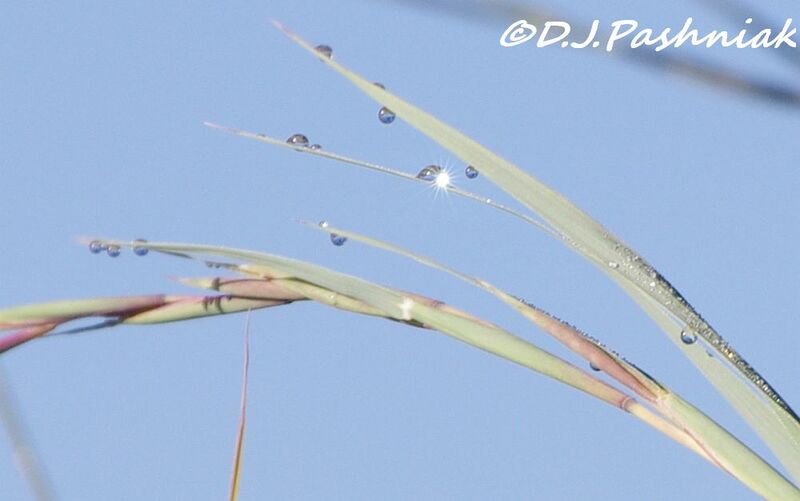 Lovely bird shots, and an awesome dew drop! Lovely series of shots, I struggle with my 300mm lens too sometimes. Love the sparkle on the raindrop shot. Your dog is opposite to mine, she is a good bird dog, ben just chases them away. Your grevillea won't take long to flower, they are fast growing plants and pretty soon the birds will be back. Yes Misty is one of the smartest breeds of dogs, they use them for cattle in our province. Those are really great shots for 300mm. It looks like your walk was pretty rewarding even though a lot have gone away for season.Haven't seen either of your birds featured here so thanks for sharing. It always to nice walk around if one can spot such sweet birds. Very nice birds you found in the trees and a beautiful raindrop! I also use 300mm lens. Thanks for your comment, Mick! Love being with these birds! Thanks for sharing! At first glance I thought this was more like a Horsfield's Bronze-cuckoo with that hint of white eyebrow but there's nothing like local knowledge & actually seeing the thing! That's one very clever dog you have there Mick. A great companion for a birding trip. Love your dog, she must have been a photographer in another life. Great shot of the bronze cuckoo, such pretty plumage. Misty sounds like a wonderful companion and a good birder as well. I think her actions are so sweet. Great shots of the Whistler and the Cuckoo - it's colorful side. Have a wonderful week Mick! What a great birding partner you have. When I take one of our daughter's Tibetan Mastiffs out birding I must stand on its leash while taking photos. Love your dog too, nice series of birds. Wonderful post Mick. I love Misty. Never seen a a Stumpy-tailed Blue Cattle dog before. She is a beauty and I love your bird photos too. ...a cuckoo species I've not heard of. The iridescent green is quite handsome. I've never heard of a Brown Honeyeater. What a pretty bird! I like a bird seeking dog! Where can I get one! From now on I will try to remember to thank Misty too for the beautiful photos I see here. I think you saw beautiful birds. Even when all the birds are gone, we can still find birds to look at! Love the droplets on the grass.